- Date: 06/2015, Seed: $400 k (post valuation: undisclosed amount). Are your beauty products toxic? Love Goodly can help. 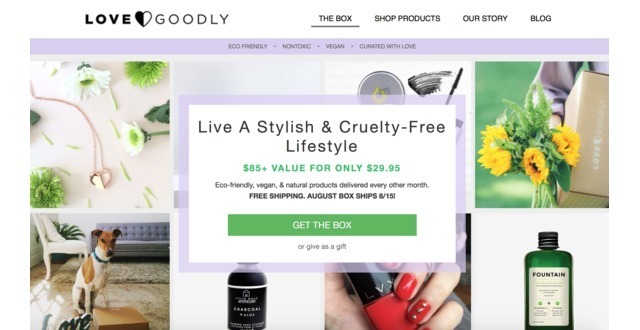 LOVE GOODLY is a deluxe subscription box for nontoxic, environmentally friendly and cruelty free products. Launching last year, they've experienced strong traction with each bimonthly box selling out. LOVE GOODLY has loyal customers and over 120M media impressions from Forbes to Us Weekly. 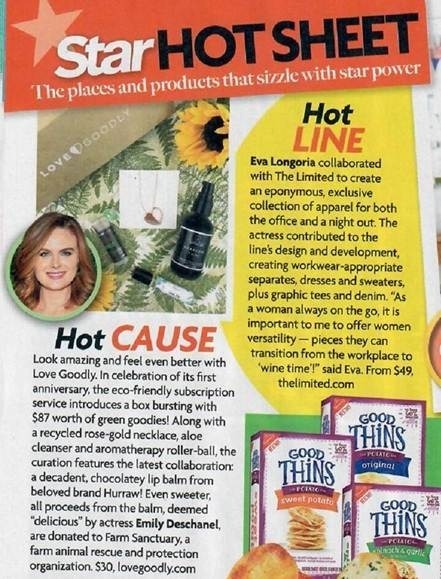 The Earth Month box was guest curated by actress and NYT best selling author Alicia Silverstone, and they have more high-profile celebrity and influencer partnerships in the works. They are hosting “Do Good. Be Green. their inaugural conference on November 5 in downtown LA bringing together community including experts, influencers and consumers, including Model Activist Angela Lindvall and the VP of Design for Reformation, to discover and embrace the best in beauty, wellness, fashion & food while spotlighting featured nonprofits. The organic beauty and wellness industry is a $30B category, and organic beauty is growing at 24% compounded annual growth led by millennials who want natural and nontoxic options. Co-founded by two experienced entrepreneurs, Justine Lassoff and Katie Bogue Miller, they worked together (Justine as cofounder / CEO and Katie as head of merchandising / founding team member) on LovingEco, a startup in the same vertical in 2011 that was acquired a year after launch by a public company backed by John Paul DeJoria (of Paul Mitchell and Patron). LOVE GOODLY received seed investment from an angel investor (Allen DeBevoise, chairman Machinima). Cofounder, LOVE GOODLY; Cofounder, TuesdayNights, invite-only women's networking community; Cofounder/CEO LovingEco, raised seed round in 2011 and acquired in 2012. Named Top 50 Women in Digital, Digital LA. BA Stanford University. Cofounder, LOVE GOODLY; Founding Team Member and Head of Merchandising for LovingEco, acquired 12 months after launch. Bogue Miller is a serial entrepreneur-- her first start-up, Label Los Angeles, was one of the first online fashion boutiques. FIDM. Veteran technologist with extensive experience in full-stack engineering, data & analytics, marketing, and product development. Previously VP Data & Product @ JustFab (4MM+ members, $1bln evaluation), Director of Engineering @ Demand Media (IPO). The business model is focused on selling subscription boxes with a growing gross margin, and on ecommerce shop orders. The products are all third party brands, bought at or below cost, and average gross margin is 50%. (The plan is to eventually include private label products as the company grows.) All brands are carefully vetted to make sure they meet high standards before inclusion, and the Company gets frequent inquiries by brands wanting to be included. As the subscription boxes grow so do the shop orders and retention. The bimonthly box subscription is priced at $29.95. Other future revenue streams include conferences, with the inaugural conference on November 5 in Los Angeles and a private label line. The competitive advantage is the cofounders and team's experience in the subscription, ecommerce and eco/natural vertical. The cofounders are experienced entrepreneurs. They were cofounder and founding team member of Lovingeco in 2011 in a similar vertical that was acquired one year after launch by a public company backed by John Paul DeJoria (of Paul Mitchell and Patron). The CTO was head of data and analytics at JustFab and previously and head of engineering at LIVESTRONG. Their consulting head of marketing has helped such brands as Honest Company, Tradesy and Vevo. By having strong relationships with the brands, the Company is able to secure exclusive products through collaborations. As they grow, they plan to launch a private label line. LOVE GOODLY added a press mention.